Safe Income Scam Review - Not Safe at All! Safe Income software found at safeincome.co looks like an opportunity in a lifetime, but don’t be fooled. Safe Income is a scam. We’ve gathered the evidences and laid it out in this Safe Income review, so do yourself a favor and read through it before you commit yourself into an elaborate trap! Do you remember how you came across Safe Income software? Was it through a shady email, an advertisement that you clicked online, or it just popped up while you were browsing the internet? In any case, “opportunities” that come out of nowhere and promising profits IMMEDIATELY is something you should be very careful of. 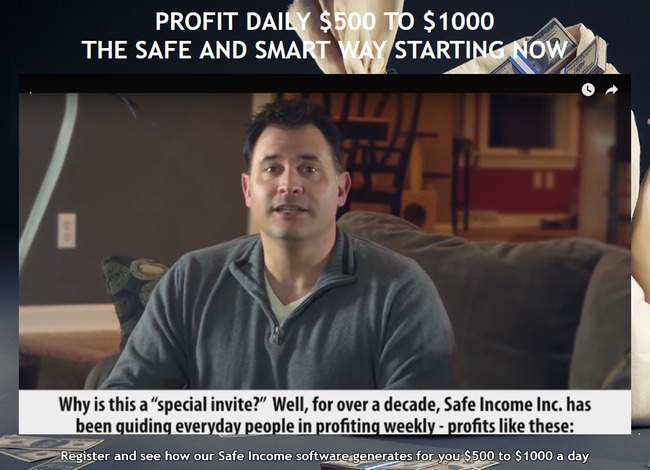 Albert J Henderson, the alleged founder of Safe Income Inc and Safe Income software, promises to make you $500 to $1,000 profits every single day. Not only that, he said that his method is “conservative”, because he doesn’t promise to make you a millionaire. However, what Albert is doing is no different than any other binary trading software scams that promise millions of dollars profits. The headline above the sales video, which promises $500 to $1,000 daily profits is just a tactic used to capture your attention and make you watch the entire sales video. It’s in the sales video where Albert tries to brainwash you into paying for the scam. In the sales video, Albert speaks of his company, Safe Income Inc. and how he has helped other people profit FOR OVER A DECADE. If it’s true, it’s certainly very impressive. His statement got us interested and we decided to look into the company. Unfortunately, what we found left us disappointed. For your information, Safe Income software can only be obtained through their website, safeincome.co because it’s tied to the broker registration. Which means, you can only use the software if you sign up for the broker account through their website. Coupled with Albert’s claim that his company has been operating for over a decade, we decided to look up the information on safeincome.co. 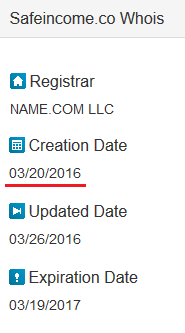 According to ipaddress.com, a whois information website, safeincome.co didn’t exist before Mar 2016. More specifically, the website promoting Safe Income Software was only created on 20th Mar 2016. The software was not available for use until Mar 2016, so it’s obvious that Albert was lying when he said it’s been around for more than a decade. Apparently the scam was a product hastily put together to make quick bucks off the internet users. If you decide to sign up for Safe Income scam, you’ll be registered under their designated broker, where you have to deposit a minimum of $300 to get started. Once you deposit into your account, the scammers behind Safe Income scam will earn a sum of referral fees. Even if you already have an account with the assigned broker, you will still be forced to open a new account using a different email address. Because if you don’t, the scammers won’t be able to earn the referral fees. Once you fund your money, it’s as good as gone. The moment you turn on the auto trader, your hard-earned money will be lost in a matter of minutes due to random trades generated by the software. Why Are There So Many Good Reviews on Safe Income Software? Safe Income is paying affiliates who promote the scam! I’m very well aware that there are many reviews out there that claim Safe Income Software is legitimate and urge you to sign up with them. The fact is, Safe Income scam is paying $275 to affiliates who manage to bring in a victim that makes a FTD (first time deposit) into the broker’s account. Unfortunately, many reviewers are swayed by the commission and decided to generate a fake review to endorse the scam. 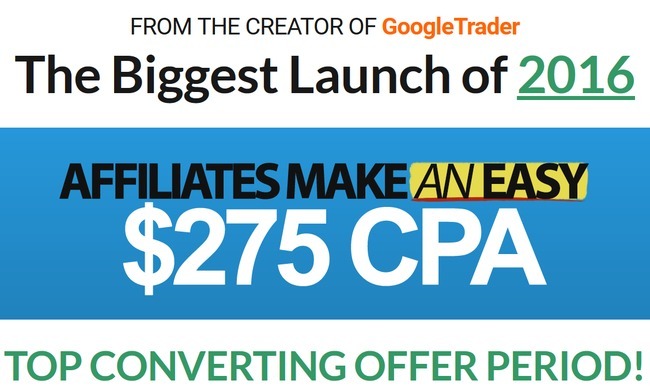 I could’ve written a raving review for Safe Income scam and encouraged my readers to sign up, and I’ll earn a nice $275 commission once they deposit into their trading accounts. In fact, it’s a lot easier to write than to look for evidences and expose this scam. Is Safe Income a Scam? YES, SAFE INCOME IS A SCAM. We strongly advise you to stay away from the scam if you don’t want to lose your hard-earned money.